September, was one of the most historic months in the annals of the 1st U.S. Infantry Division and the 18th Infantry Regiment. It carried the 18th Infantry, after the August routing and pursuit across France of one of Hitler's finest Armies, to the very gates of Germany proper. During this month hundreds of the foe had been killed and hundreds captured in their frantic retreat to the Fatherland. Enormous quantities of supplies had been seized, to say nothing of the fabulous number of enemy guns, tanks and vehicles destroyed. In spite of the numerous local skirmishes and stiff rear guard resistance, the Regiment pushed on to what culminated in a partial piercing of the Siegfried Line and the seizure of positions from which to launch an attack on Aachen, the important gateway city to Nazi soil. On September 1st, the Regiment left Laon, France, in a motorized move to objectives in the vicinity of Marle et Berthaine. The 1st Battalion, as the advance guard, encountered the enemy in the vicinity of Dercy, a few miles from the main objective. After a stiff fight the enemy was subdued and the remainder of the Regiment was free to push on. 57 prisoners were captured by the 1st Battalion in this fight. They destroyed an anti-tank gun and administered many casualties on the enemy. The 1st Battalion took positions in Dercy to protect the left flank of the Regiment. The 2nd Battalion pushed on to Attencourt and the 3rd Battalion to Marle. All around defense was taken up for the night. Road blocks were established and a patrol from Company "F" was sent to the towns of Voyenne and Erlon to clean up enemy reported there. Four of the enemy were captured. The next morning the Regiment continued its motor march to Le Nouvion with the 1st Battalion again as advance guard. At Lemé, a small town on the route of advance, an enemy strong point was met which resulted in 18 prisoners. 60 more prisoners were taken when the column met an enemy anti-aircraft group at a crossroad North of Lemé. Still hitting small pockets of resistance the Regiment pushed on to its objective. When the day ended the 1st Battalion had taken up positions in the vicinity of Beaurepaire, and the 2nd and 3rd Battalions, in the vicinity of Esquéhéries and Le Nouvion. On September 3rd the 18th Combat Team was headed for the important road center of Bavay, a few miles from the Belgian Border. At Bavay a German anti-aircraft unit was entrenched with orders to hold at all costs. The 1st Battalion, who was still the advance guard, struck swiftly, however, and the enemy was driven from the town. Simultaneously, the Air Corps had struck an enemy column moving Northeast toward the town apparently retreating to Germany through Southern Belgian. Great devastation resulted and what remained of the column were small wandering groups searching for a way out of their plight. Heavy fighting ensued throughout the day in Bavay and, although many casualties were sustained by the 1st Battalion the enemy lost heavily. Over 150 were killed or wounded and 400 taken prisoner. Later in the day an enemy column again attempted to enter the town from the Southwest and again they were dealt with severely. 50 more of the foe were captured and six trucks destroyed. The 3rd Battalion had been sent to take up positions on the Eastern edge of the town to protect from the North and East. During the next two days groups of lost and wandering enemy were captured which resulted in 1300 prisoners for the Regiment in this one engagement. The 2nd Battalion contributed greatly to this as they were moved to Sars la Bruyère, Belgium on 4 September and in that position had repulsed, in a night fight, a superior enemy who attacked their positions from the West. When day broke the Battalion had chalked up to its credit 50 enemy dead, 160 wounded and 483 unwounded prisoners, six artillery pieces, 150 horses, and a large number of supply wagons. This action at Bavay had resulted in a decided defeat for the German Wehrmacht, and one that he would not forget. Rank and organization: Private First Class, U.S. Army, 18th Infantry, 1st Infantry Division. Place and date: Near Sars la Bruyère, Belgium, 4-5 September 1944. G.O. No. : 64, 4 August 1945. Citation: He was serving as a machine gunner in the vicinity of Sars la Bruyère, Belgium, on the night of 4-5 September 1944, when his company was attacked by a superior German force. His position was overrun and he was surrounded when our troops were driven back by overwhelming numbers and firepower. Disregarding the fury of the enemy fire concentrated on him he maintained his position, covering the withdrawal of our riflemen and breaking the force of the enemy pressure. 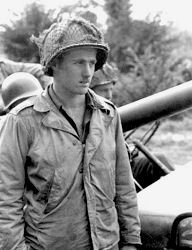 His assistant machine gunner was killed and the position captured; the other 8 members of the section were forced to surrender. Pfc. Merli slumped down beside the dead assistant gunner and feigned death. No sooner had the enemy group withdrawn then he was up and firing in all directions. Once more his position was taken and the captors found 2 apparently lifeless bodies. Throughout the night Pfc. Merli stayed at his weapon. By daybreak the enemy had suffered heavy losses, and as our troops launched an assault, asked for a truce. Our negotiating party, who accepted the German surrender, found Pfc. Merli still at his gun. On the battlefield lay 52 enemy dead, 19 of whom were directly in front of the gun. Pfc. Merli's gallantry and courage, and the losses and confusion that he caused the enemy, contributed materially to our victory . September 6th was an historic day as the Regiment, as a whole, moved across the Belgium border and started East toward Germany. The route carried it through a massive wreckage of German vehicles, wagons, and guns of all calibre that had been caught on the road by our air force. The advance was unopposed and the Regiment received a rousing reception from thousands of civilians who lined the streets of Charleroi, where it bivouacked for the night. During the next three days an unopposed march was made to Namur, then Liège, the famous fortress city of Belgium. Here a 24 hour stop was made and the men were given a chance to rest and clean house. On September 10th, the Combat Team moved across the Meuse River toward Herve, one of the last large Belgium towns before the German Border. Some enemy shelling was encountered during this move and at Herve enemy rear guard action was met. We had once again caught up with the fleeing foe. Strong defensive positions were established around this town and the 3rd Battalion was sent to occupy the forts in the vicinity of Battice. After a brief engagement the enemy withdrew Eastward. The Regiment remained in these positions until the evening of the 11th when it made a 7 mile march to Aubel to the East. Enemy shelling increased and resistance grew more stubborn. The next day the Regiment pushed on to the high ground North of the town of Obsinnich, then, during the 13th, took the high ground North of Gemmenich, in the Aachen State Forest, overlooking the city of Aachen. The 3rd Battalion took positions at the junction of the Belgian-Holland-German Border, covering the North flank of the Regiment. The 1st Battalion had to fight its way to its objective in the forest to the South of Aachen. They encountered many pillboxes and a stubborn enemy. After a series of stiff clashes the enemy was subdued and many prisoners were taken. The remainder of the month was spent in regrouping and strengthening positions. Vigorous patrolling was established and much probing was carried out against the enemy who had taken up defensive positions on the perimeter of the city. Several small scale counterattacks were broken up with many casualties administered to the enemy. On 19 September the 3rd Battalion was moved to a position east of Aachen and reverted to control of the 16th Infantry. 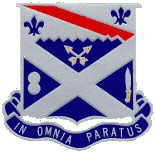 Thus, the 18th Infantry Regiment had taken part in the partial piercing of the Siegfried Line. It was now overlooking one of the key cities to the Reich and preparing and steeling itself for the offensive that was sure to come.